Do you love taking pictures and figuring things out? Do your notes share information between the scientific method and F stop values? A career in scientific photography might be your lens to a successful future! Scientific photographers work at labs and in the field, recording accurate subject images for scientific or medical studies and recording phenomenon. They often use microscopes for capturing still images of research material. As a scientific photographer, you will work with scientists or researchers and need to be able to deal with the technical and scientific end of the business just as much as the business and marketing end. Your working environment can have some variation, but most of your work will be in labs, taking photos through a microscope. In some instances, it may require field work, taking photos of populations in the wild for agricultural or conservation use. You will also need to travel to your customer’s site and haul equipment. You will want to develop some specific qualities for scientific photography, including artistic ability, computer skills, being detail-oriented and having good business, customer service, communication and interpersonal skills. Keeping good records of not only business transactions but also of each photo you take for accuracy. A bachelor’s degree in biology, chemistry, medicine or photographic arts is required by most employers, with some crossover coursework including science courses, camera and equipment use and maintenance, processing, editing and shooting techniques. If you’re planning on freelancing, you’ll also want coursework in business, accounting and marketing to have a better grasp of managing the business side of things. While you’re in school, you’ll want to develop a portfolio, a collection of your current, good-quality photographs to show your clients. If you’re able to find an experienced scientific photographer to assist, you can pick up additional experience and portfolio pieces, as well as meeting prospective future clients. Taking classes, workshops or attending conferences will give you a good opportunity to make connections and keep on top of advances. Want to live down on the farm? Agricultural and food scientists research ways to make our fields and barns more productive with less impact on the earth. Want to know the secrets of life? Biological technicians assist researchers in pushing the boundaries of what we know about the living world around us. Chemists and materials scientists develop new products, materials and processes by researching chemical structure. Are you a more creative photographer? Crafts and fine artists create pieces of art from an array of materials. What’s your by-line? Desktop publishers design layouts for a variety of printed or online documents. Want your name in lights? Film and video editors and camera operators work in a variety of industries to create a large amount of video media and edit it into a single piece. Medical scientists direct research on a variety of topics aimed at improving human health. Scientific photographers received an average hourly rate of $14 per hour in May of 2010. Many photographers work on a part-time self-employed basis, keeping a flexible schedule to allow time for meeting with clients and scheduling shoots. 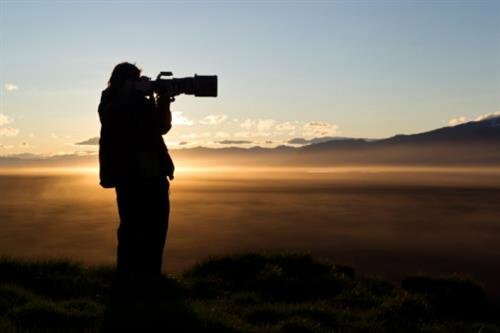 Scientific photographers will see an increase in job opportunities of about 13%, fairly in line with the average job growth predicted for the ten years, though growth for self-employed photographers is expected to increase at 15%. There is strong competition for jobs, and salaried positions may be difficult to come by.